A bunion, which affects the base of the big toe, occurs when the metatarsophalangeal joint becomes enlarged and starts to stick out. As a result the big toe may start to point towards the second toe. In severe cases the big toe may even go under or overlap the second toe. Bunions are often painful; especially when you wear shoes or do a lot of walking or running. 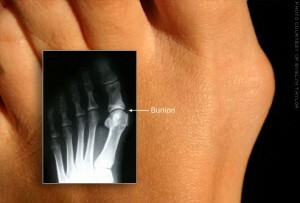 Signs of a bunion may include an enlarged joint, soreness, redness, tough skin, and even arthritis in advanced cases. Bunions are quite common as more than 50 percent of women in the United States have them. The deformity is typically caused by wearing tight or narrow shoes such as high heels, but genetics can play a role as well. Wearing shoes that are too tight can also cause corns, calluses and hammertoes. A bunion can usually be diagnosed with a simple examination of your foot. At the time of your exam the doctor will ask you to move your toe up and down to see if your range of motion is limited. The doctor will also look for signs of redness, swelling and pain. Once the physical exam is complete, X-rays will be taken to confirm the diagnosis, rate its severity, and possibly identify its cause. Non-surgical treatments like wearing wider shoes and toe splints are usually recommended to alleviate bunions. If these treatments don’t produce positive results or the bunion is too advanced at the time of diagnosis, surgery may be needed. Bunion surgery (bunionectomy) is a more permanent solution that requires an incision to be made at the top or side of the big toe. During surgery the doctor will remove part of the bone or realign it so it is in a correct position. Recovery depends on a number of factors, including the severity of the bunion, what was done during surgery, the type of surgery performed, and a patient’s tolerance for pain. For the first few days after surgery it may be difficult to place any weight on the foot, but it is important to do so as soon as possible. Crutches are required and you may feel pain for several weeks. If you are not physically able to walk on crutches you may need the assistance of a wheel chair. Keeping the foot elevated and applying ice will help significantly with swelling. Physical therapy is the most important part of the recovery process as it will help you regain proper range of motion. Patients can expect a full recovery about six months after surgery. Our Foot and Ankle Center consists of orthopaedic surgeons and a podiatrist so that we can fully evaluate and treat your condition. For more information about bunions and to make an appointment, call 904-825-0540.